Michelle and Phil John join Paradise Rotary Club as Dual Members. Michelle John, Supt. 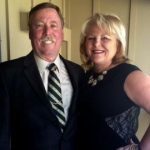 of Paradise Unified School District (PUSD) and her husband Phil John, a self employed hospital consultant were inducted into the Paradise Rotary Club by Club President Lauren Gill at our January 4th meeting. They are both long time residents of paradise with Michelle serving several different positions in the PUSD before becoming District Supt this summer. Phil consults with hospitals andother medical organizations in billing and other issues. Phil also serves on the Butte County Planning Commission as Commission Chair. They are considered Dual Members of our club. This is a recent change in Rotary Membership types where both members contribute to the primary members attendance at our Rotary Meetings held each Thursday noon at the Lutheran Church on Skyway. Phil and Michelle were proposed for membership by Bob Irvine and Robert DiPietro, both long time members and past presidents of the club. This couple are great additions to our club and have already started work integrating into our clubs culture of giving back to our community and world.